"Is there any way for me to download RTMP stream from MySpace or other sites on Mac or Windows PC?" "How can I download live RTMP streaming?" Many users have the need to download RTMP video or audio streams. If you want to download videos from sites with RTMP protocol, here is the right place for you. This guide will share an easy way to achieve RTMP download for RTMP steaming videos without any fuss. 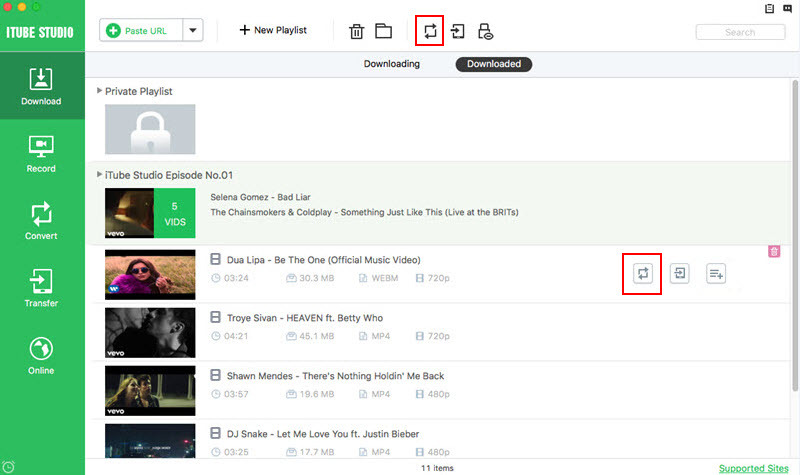 To download RTMP stream on Mac, I will introduce you to a good RTMP downloader that is iTube Studio. 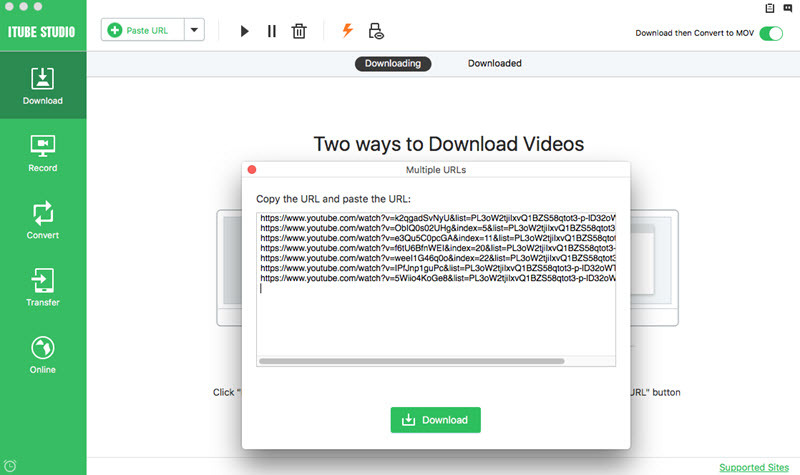 By using this smart RTMP video downloader, you can download all types of videos including RTMP from sites like MySpace, Crunchyroll and more. This video downloader also has the ability to convert the downloaded videos to many popular formats like MP4, MOV, AVI, MKV, WMV, and so on. Download RTMP and other types of videos from more than 10, 000 video-sharing sites. Batch download videos at one time and manage multiple downloading with task sceduler. Convert videos to any video and audio formats, and even to devices directly. Transfer downloaded RTMP videos to mobile devices or sync to iTunes Library automatically. Play downloaded RTMP videos with its inbuilt media player without operating system limitations. Below Mac guide will be an example on how to download RTMP streaming on Mac (macOS High Sierra, Sierra, EL Capitan and Yosemite) or Windows PC step by step. Click above Download button to get .dmg file for the application. Then open the file to get installation menu. Just follow up the prompts to finish installing the program on your Mac. When you're done, the program will launch automatically. And you will get the main interface shown as below. Open Safari, Chrome, Firefox or Internet Explorer and go to the video sites to find the video file you need. When you play the video, you see a "Download" button appears on the top left corner of the main interface. You can directly click the button, and the program will load the file and start downloading. Alternatively, drag the URL icon of the video to the program, the file will be downloaded automatically. Or copy the video URL and click the "Paste URL" button on the main interface of the program, the video will be captured immediately. When the program is in working progress, you can enjoy other online movies or videos. If you find another interesting video, you can use the same procedure to add it to the downloading queue. After the videos are downloaded, you can view the video list in the "Download" tab. If you want to convert the video to other format, click the "Add to Convert List" icon on the right of the video thumbnail to import video to "Convert" tab. From "Convert" tab, you can find a "Convert" icon on the right of each video file, click this icon and you will get a pop-up window for format list. You can click the "Video" tab to select an output format. Or you can click the "Audio" tab and select an audio format to extract only the audio from the video. 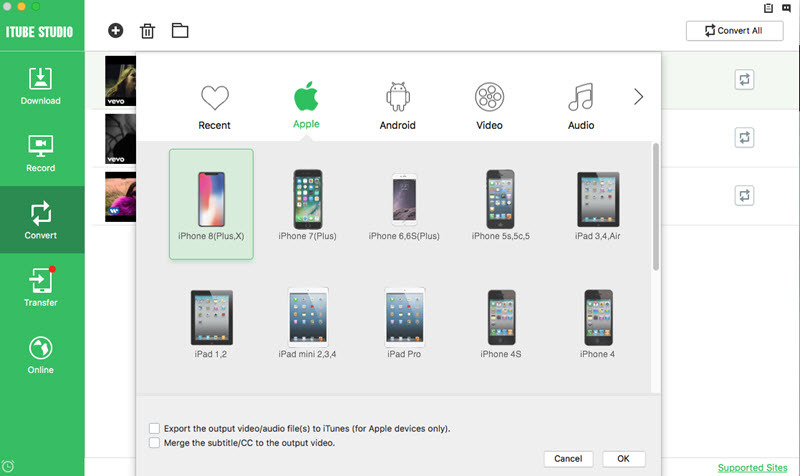 If you want to transfer the video to your portable device, you are able to directly select a device name as output according to your device model. If you are working on Windows PC, you can use iTube Studio for Windows version. This Windows RTMP downloader allows you to download videos in RTMP protocol from many video-sharing sites. 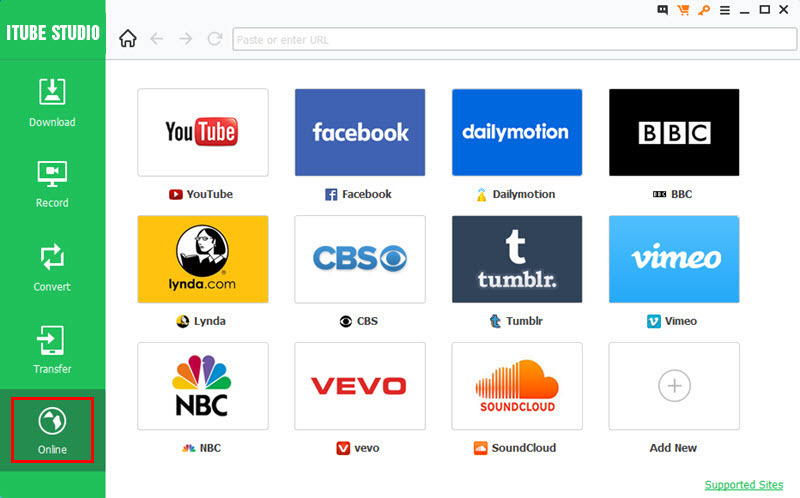 Its built-in browser lets you to search your favorite online videos conveniently. What's more, this RTMP downloader provides you with a RTMP player that you can directly play the downloaded videos or your desktop videos. This RTMP player supports various video formats so you do not need to worry about the compatible issue. Fully support for HTTP/RTMR/RTMPS/RTMPT protocol. Download videos from over 10,000 video sharing sites. Download 4K & Full HD video quickly and quality-losslessly. Convert videos to other formats and for devices. 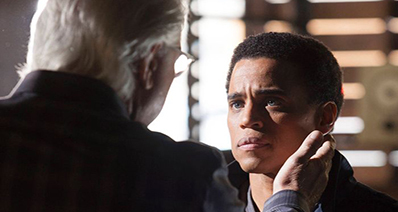 Transfer downloaded RTMP videos to mobile devices to enjoy anytime. RTMP video downloader works well with Windows 10, Windows 8, Windows 7, Windows Vista and Windows XP. Below detailed guide will show you how it works. Click the link for the program file to download the Windows RTMP stream downloader. After that, double click the file to open the installation instruction and follow up steps to finish the installation. And the RTMP player will be installed on your Windows PC as well. Then you can double click the program to launch it. 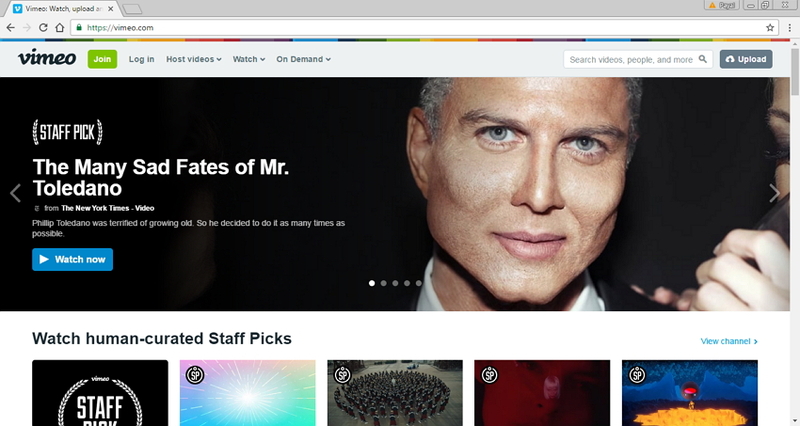 Now go to the "Online" tab to find the videos you want. When you play the video, you will see a "Download" button on the video window. Click on the button and choose a video resolution, the program will load the video and start downloading it. You can also download the videos by copying the video URL or dragging the URL to the program. With the help of above recommended tutorial, you will have no trouble to enjoy video in such type. Just take a trial. The Real Time Messaging Protocol was developed as a protocol to handle the streaming of audio, video and data over the internet. Its core technology focuses on linking a flash player and a server. Adobe has since acquired RTMP and made it open source. RTMP protocol is used for streaming video by sites including MySpace, Discovery, Crunchyroll, BBC, NBC, and more. What can I do with RTMP? 1. Live Streaming: RTMP has the capacity to deliver a high quality live stream. In simple words live audio and video can be transmitted over the internet at scale. Many media companies such TV stations are using RTMP. 2. Build Text and Video Chat Applications: RTMP is responsible for powering over 50% of all the text and chat applications on the internet. The technology is widely used due to its ability to scale cheaply. 3. Create Online Multi-Player Games: online multi-player games such as World of Warcraft owe much of their success to the capabilities of RTMP. These games have grown from flash games on the obscure corner of the internet to a mainstay of modern culture.